The stage is supposedly set for LeBron James to hold his 1 hour ESPN show from Greenwich, Connecticut. ESPN Radio has confirmed that the network has booked the Boys and Girls Club in Greenwich, Connecticut from 7-10pm Thursday night. Also, LeBron James is expected to fly to Greenwich, Conn. shortly for his sit down interview with ESPN, according to sources close to James. Ironically, the New York Knicks training facility is located in Greenwich, Conn. So you put the pieces together, just off that info, and I think you can safely conclude that LeBron James will be playing for the Knicks. “Breaking News!!! 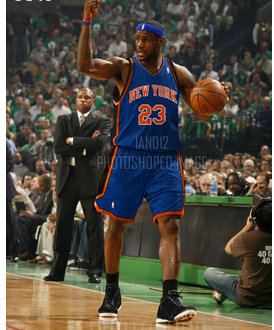 My sources tell me Lebron will announce that he will be goin to the NY KNICKS tomorrow on ESPN.. This is serious.. WOW!!! !